Wizkid grabs 7 nominations at the billboard music awards – Royal Times of Nigeria. 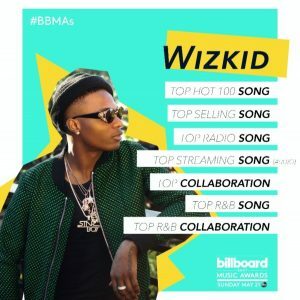 Nigerian Afro-pop star, Wizkid has been nominated for 7 awards at the upcoming 2017 Billboard Music Awards to hold on 21st of May. The nominations are for collaboration with Drake & Kyla on “One Dance”. The other categories include Top Hot 100 Song, Top Selling Song, Top Radio Song, Top Streaming Song, Top Collaboration, Top R&B Song and Top R&B Collaboration.